You know that post right down there that I just published yesterday about Minted? Well guess what. 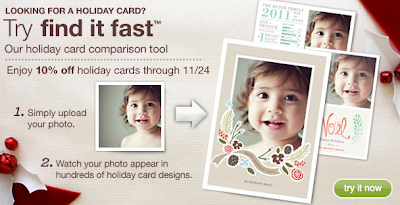 You can save 15% off all holiday cards through November 28, 2011 with the code READERS52. I don't gain anything by my readers using that code. Minted was just kind enough to pass along the discount! So click on over and start saving! Lyndsay!! I am so glad I stopped by your blog this morning - as you can imagine, I'm not really reading many blogs right now. I just clicked through and found several cards I just LOVE! Getting our cards ordered is one of my priorities in the next couple of weeks - but first I have to get Matt to get a picture of all THREE kiddos together! I am now even more motivated to start because I can't wait to use this site. YAY! Thanks for posting about it and double YAY for the discount!! !